Spray your mini bundt pan (or chosen bakeware) with cooking spray. I've found that using cooking spray is enough to prevent the cake from sticking... but if you find flour works best for you, you can flour your pans as well. Meanwhile, in the bowl of an electric mixer, cream together butter and 1/2 cup of sugar until light and fluffy. Add the eggs and lemon zest and mix until combined. 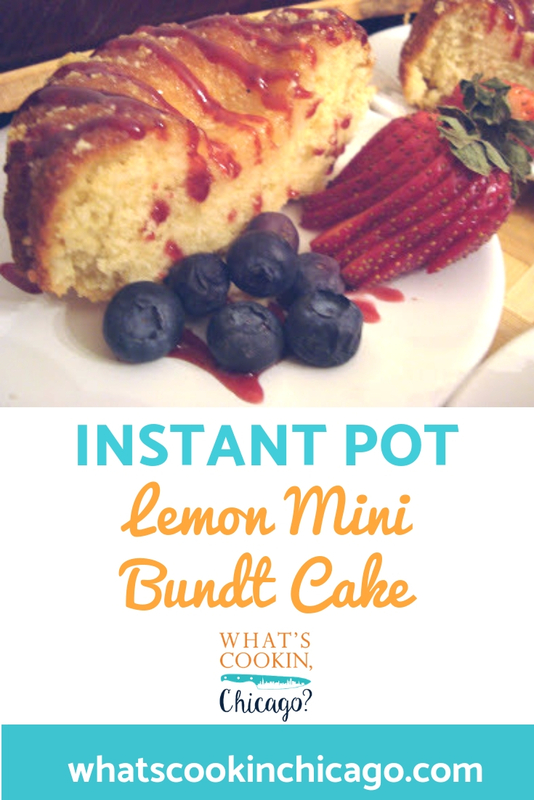 Carefully place the filled bundt pan on a trivet with handles and lower the cake into the bottom of the Instant Pot. You can also use a sling if you don’t have a trivet with handles. Cover with foil or silicone cover. When the IP beeps after pressure cooking for 40 minutes, allow your IP to naturally release pressure for 15 minutes. While naturally releasing pressure (also known as NPR or NR), the display will reflect numbers counting up from 1. The numbers indicate how many minutes the IP has stopped cooking since it beeped (or how many minutes it has been naturally releasing pressure). No need to touch your IP while it naturally releases pressure. The pin at the top of your IP will drop when all pressure has been released and it's safe to open. Open up your IP when the pin has dropped (allow a few minutes for this to happen). The IP will automatically default to the WARM mode - turn to OFF. Carefully lift cake from the IP and allow to cool completely before frosting. Prepare the lemon glaze while your bundt is pressure cooking by whisking together in a small bowl the lemon juice and remaining 1/2 cup of sugar. Poke holes all over the top with a fork or skewer and pour lemon-sugar mixture over the cake. Cool bundt in the pan on a rack for 30 minutes or as long as you can stand it. Serve warm or cool. I garnished my cakes with a sliced strawberry, raspberry puree (drizzled on) and fresh blueberries.